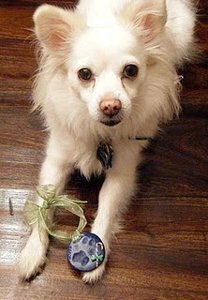 Let your precious pooch in on easy Christmas crafts by making these paw print ornaments from Erika Lindquist to decorate your tree with. These make great gifts from Fido to his owner! First things first - make sure your pooch's paw is clean to avoid a dirty paw print! 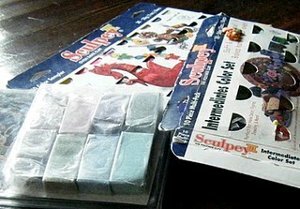 Roll a piece of Sculpey into a ball and then flatten it with your hand (Sculpey can be bought at any craft store). Make sure you have enough to fit the whole paw plus additional room for decor and ribbon hole. The first thing you want to do is the actual paw print, trust me! Make sure you press down each area of the paw. If it doesn't work out the first time, roll it up into a ball and start over. If your dog is wiggly, this will be the hardest part. 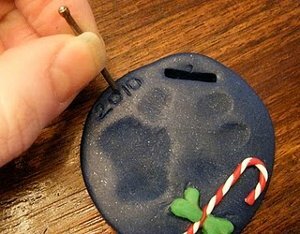 After you get a decent paw print you're happy with, it's time to decorate!! Start with the hole for the ribbon. You can do a circular hole with a nail of some sort or you can do a flat rectangular hole with a misc. object. The end of my spoon worked perfectly. The decorations for the ornament are endless! 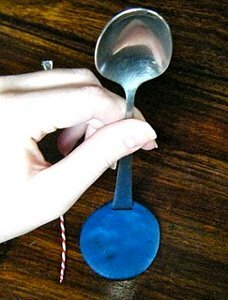 You can use rhinestones, beads, carve your dog's name, make shapes out of sculpey, etc. I used a nail to carve the year "2010." When you're all done decorating, bake the clay at 275 degrees in the oven. This piece took 6 minutes. Larger dogs will require bigger pieces of clay and will need to bake a little bit longer. 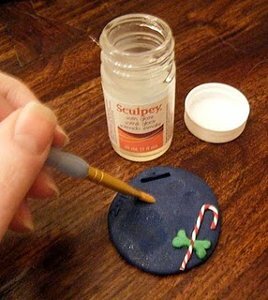 Then glaze the ornament to give it that finished look and extra protection. Let the glaze dry, string some ribbon through, and voila!! Time to hang that baby up on the tree for all to see. I love the idea! I wish this article had been online as far back as 2006: I could have made a tag for my beloved Cocker Spaniel 'Q the Omnipotent', and then in 2010 for my other beloved Cocker Spaniel 'King Cole'. How I miss them both so much..... But I can and will make one for my beloved 'Queen Sarah'! I love this ornament ! 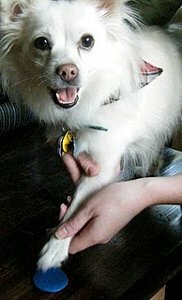 I would love to make one as a remembrance tag for our 15 year old Pomeranian we lost this summer. It would have to have her name and dates on it too though. Maybe on the back side ? Over the years, I have received these paw print mementos from my vet when my dogs passed away. Although I appreciate greatly these remembrances, it would be a happier occasion to make these with new puppies, which I think I will do next time I get a puppy.